On the 2nd (Fri), get in on the family fun at Universal Studios Hollywood. To find traveler tips, reviews, ratings, and other tourist information, read our Los Angeles trip itinerary planner. Fort Wayne to Los Angeles is an approximately 8-hour flight. You can also drive; or do a combination of bus and train. Due to the time zone difference, you'll gain 3 hours traveling from Fort Wayne to Los Angeles. Expect slightly colder weather when traveling from Fort Wayne in June: highs in Los Angeles hover around 29°C, while lows dip to 19°C. Finish your sightseeing early on the 2nd (Fri) to allow enough time to travel to San Francisco. 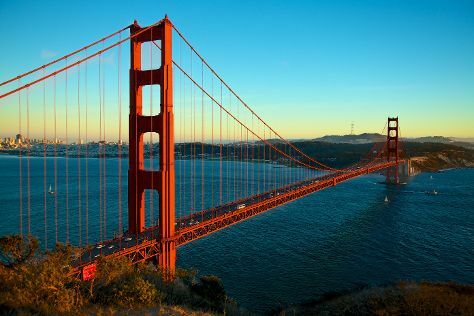 Kick off your visit on the 3rd (Sat): explore the engaging exhibits at The Exploratorium, then make a trip to Lombard Street, and then snap pictures at Golden Gate Bridge. On the next day, take a stroll through Fisherman's Wharf and then step off the mainland to explore Alcatraz Island. To see maps, other places to visit, photos, and tourist information, read our San Francisco vacation builder. You can do a combination of train and flight from Los Angeles to San Francisco in 4 hours. Other options are to drive; or take a bus. In June, San Francisco is a bit cooler than Los Angeles - with highs of 25°C and lows of 15°C. Finish up your sightseeing early on the 4th (Sun) so you can travel back home.